Pau Sans Please | Who says learning a language is a bore? Who says learning a language is a bore? School year 2011-2012 is almost finished and it’s time to remember our favourite songs. 1ST PRIMARY SCHOOL – DO YOU LIKE ICE CREAM? 2ND PRIMARY SCHOOL – I LIKE YOU! 2ND PRIMARY SCHOOL – HOP TO THE TREE! 2ND PRIMARY SCHOOL – NO CHEESE! This entry was posted in General and tagged song on 20 juny 2012 by jagut. Here you’ve got a new version of our favourite travelling song, as funny as ever, these time sung by fourth formers in May 2012. This entry was posted in General and tagged song on 28 maig 2012 by jagut. As summer is near, we want to suggest you some places to go on holidays and how to go there. Do you like travelling by boat, or maybe you preffer a helicopter? Here, you’ve got tho versions: the serious one and the have-a-nice-summer one. This entry was posted in General and tagged Afegeix una etiqueta, song on 16 juny 2011 by jagut. This song is always one of the big hits. We really love singing and dancing this nice music. This entry was posted in General and tagged song on 16 juny 2011 by jagut. The person who works there is… the potter!! We learnt how to make clay roses, and how to use the potter’s wheel. This entry was posted in General and tagged photos gallery on 28 abril 2011 by jagut. Do you want to know what second formers like for lunch? Listen to the song and enjoy your meal! This entry was posted in General and tagged song on 27 abril 2011 by jagut. This is the very first performance of ‘The 3rd Form Band’. A complete band playing for you one of their future hits!! The name of the song is “Who can sing?”. Enjoy it!! This entry was posted in General and tagged Afegeix una etiqueta, song on 7 abril 2011 by jagut. This is a very nice song sung by second formers. This entry was posted in General and tagged song on 24 març 2011 by jagut. 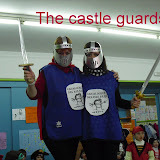 We celebrated Carnival in our school. Do you want to see the costumes we wore? Here you’ve got the album! This entry was posted in General and tagged photos gallery on 24 març 2011 by jagut. – Say the title of the song and the singer or group in the “comentaris”. – The song must be sung in English!! This entry was posted in General and tagged favourite songs on 17 març 2011 by jagut.